It all started with a little pack of Sesame Snaps. I picked them up from the international market last weekend, and once at home I nibbled on them as I prepared lunch. They were ever so subtly sweet, and packed with nutty sesame flavor. I was instantly smitten. The next step was obvious, I had to figure out how to make my own. Before I continue with the candy recipe, I'd like to digress for only a moment...yes, that's a macaron you see. I have made them yet again. But with good reason. 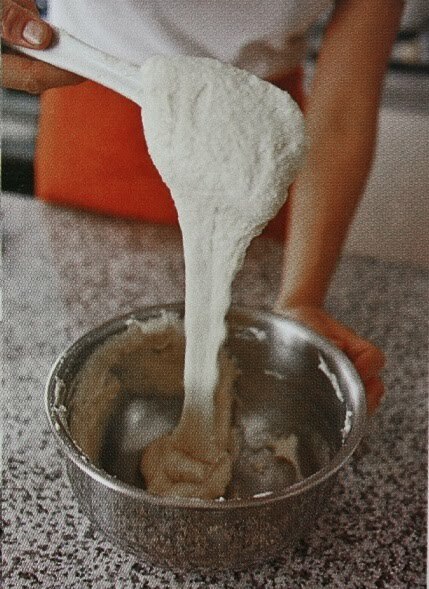 I recently picked up the "I love macarons" paperback and I want to share a picture from the book that may be helpful for macaron making. For this recipe, you'll need a 12 oz. 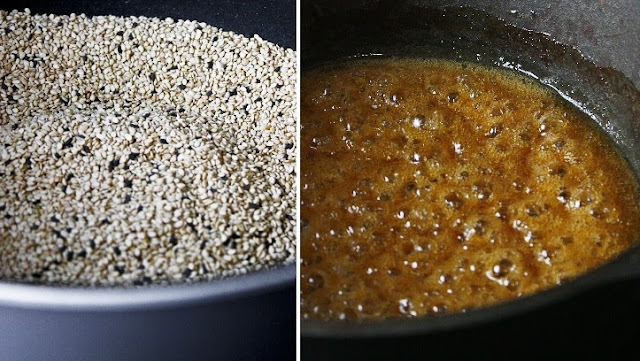 package (roughly 2 cups) of white sesame seeds, and 4 tsp. black sesame seeds (plus a little extra black if you embellish them as I did). I'd suggest buying these at your local Asian market. The packages sold in regular grocery stores are much more expensive. I paid .99 cents for the white sesame, and $1.50 for the black. A well greased/sprayed cookie sheet and/or silicone mold. I used a spray bottle of canola oil, and it made this process so much easier! A sheet of parchment, greased on one side. You'll use this to press your candy into the cookie sheet or mold. 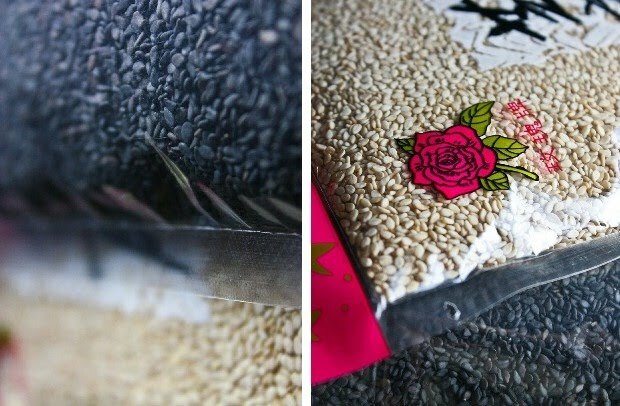 Toasted and measured sesame seeds. Be careful when toasting your sesame seeds. Over-toasting can make them very bitter. Use your nose for this one. The color change will be slight, and you should remove them from the heat when they become fragrant. If you have a cast iron oven, I would suggest using it for boiling the candy mixture, which is just brown sugar and honey. You can also add cinnamon or ground ginger to give the candy some flavor interest. The brown sugar and honey make a perfect "shellac" for the sesame seeds. I think these are so pretty! As you can see I used the Wilton Brownie Bites pan as a mold. I first poured the hot candy mixture onto the greased cookie sheet, then pressed it down a bit with the parchment. With a metal fork, I picked up small pieces of the candy and transferred it to the mold. You can press the candy into the molds with smaller piece of greased parchment, or if the candy is cool enough you can use your fingers. The candy will harden to a slightly chewy but still crunchy texture. Of course I had to add extra embellishment. You know me, if there's ever a lily around to gild, I'll be there with my paintbrush. 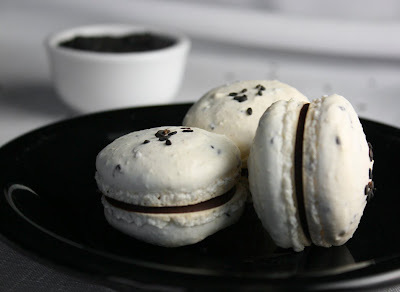 I added a white chocolate stripe and sprinkled on black sesame seeds. 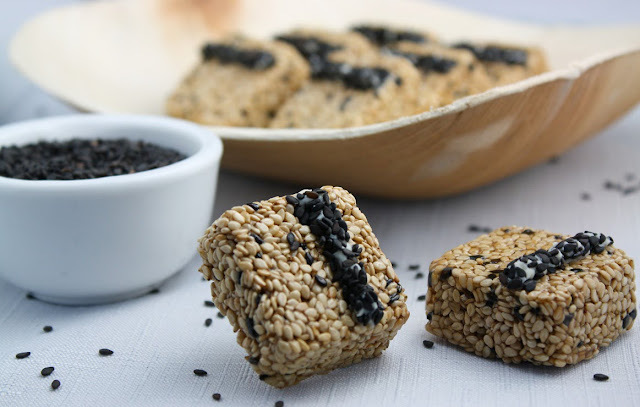 A simple, home-made version of Sesame Crisps. 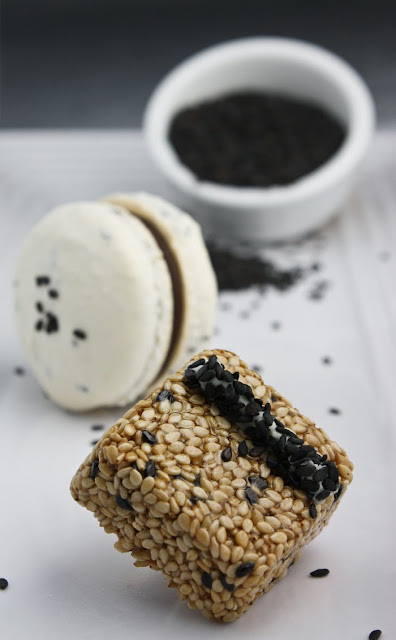 See Sesame Candies on Key Ingredient. I just had to sneak in a few more macarons. I couldn't help myself. Especially after picking up this book! It is informative, and overall, just darn cute. 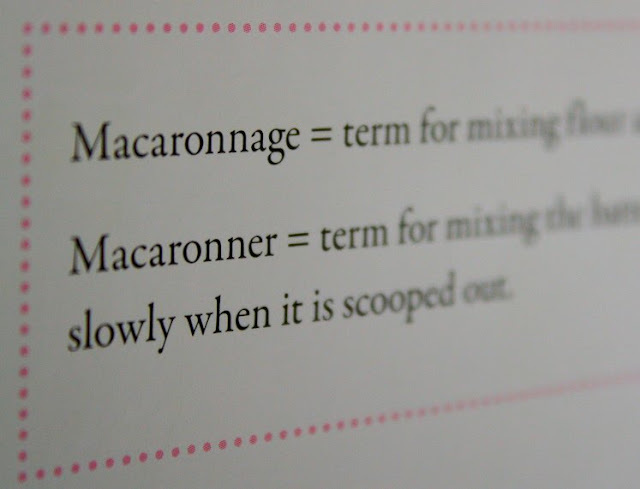 It's a thinnish paperback that gives tips and pointers - even macaron lexicon, which I never knew existed. Hmm, not really sure that will help my macaron making. But okay. The picture below is what I found most helpful. It gives you an idea of the consistency your batter should have just before putting it in your piping bag - not runny like cake batter, but a bit heavier and folding into large thick ribbons in the bowl. I was happy to see that the book held a recipe for sesame shells. I have a large amount of black sesame left over from candy making. The recipe differs slightly from my tried and true version. I didn't want to mess with a good thing, so I just used the suggested additives to the recipe I already use. I filled them with melted dark chocolate and they were excellent! I'll mention again, the shell recipe I use is HERE, and I stand behind it. Totally. There are lots of great recipe variations and information in this book. It even has recipes in the back for left-over egg yolks. Pretty neat! ....and cute. Just, too cute. That sesame candy looks super yummy! I don't think I've ever had a macaron. Thanks for posting this again and linking to your post with the recipe! I am going to be making green ones for St. Pattys day and I am nervous b/c it will be my first time and it does not look easy!! All of your creations look so professional! I am always so impressed by what you are up to! The candy and macs look fantastic! 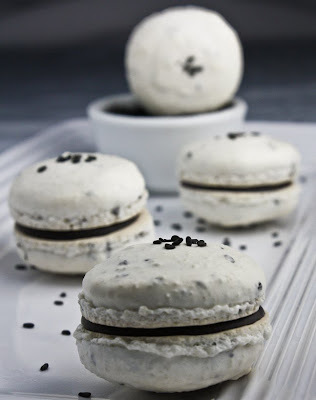 The only kind of macaroon I've ever had were big dense hunks of coconuty sweetened condensed milk dough concoctions. They're good don't get me wrong, but they didn't look nearly as pretty as those macaroons do. I wonder if it's a regional thing. Washington State thing to be more precise. Your candy looks delicious, I love the nutty flavor of sesame seed. I've seen that book but haven't had a chance to really check it out. It looks adorable! And these sesame candies look DELICIOUS. I love sesame anything! oh, that candy looks good!! Very interesting, I don't think i've ever had sesame candy. I love the extra embellishing you did. 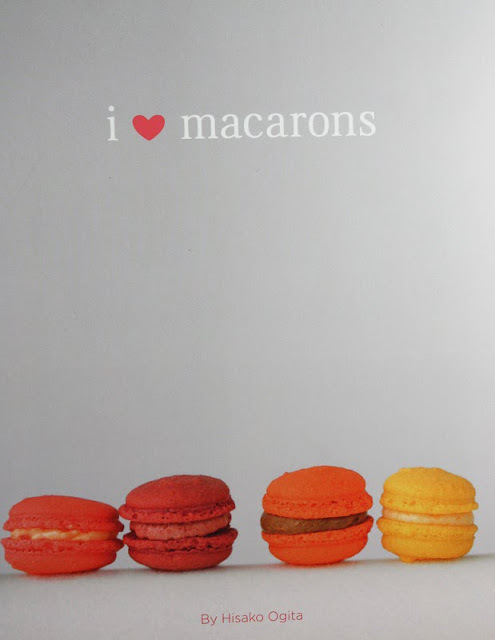 And what a FUN macaroon book!! Just the photos look wonderfully good! This Sesame Candy is so intriguing. I've never seen anything like it before (where do I live, a cave?). And, as always, your photos are gorgeous. It's a pleasure just to look at them! Your sesame candy sounds wonderful! Well, I think there is seriously nothing wrong with making macarons every day... Ok, maybe my waistline will disagree but still... I think I just gotta get myself that book too... I love your sesame candy! sesame candy OMG! i try it! it will very very sweety gift my students.. I absolutely love your blog! Thank you for sharing this recipe. I am absolutely convinced this is a very huge meal to prepare, I would like to make this recipe at home immediately getting all ingredients, It looks so tasty. I am going to do both of these thank you for great recipes and inspiration! 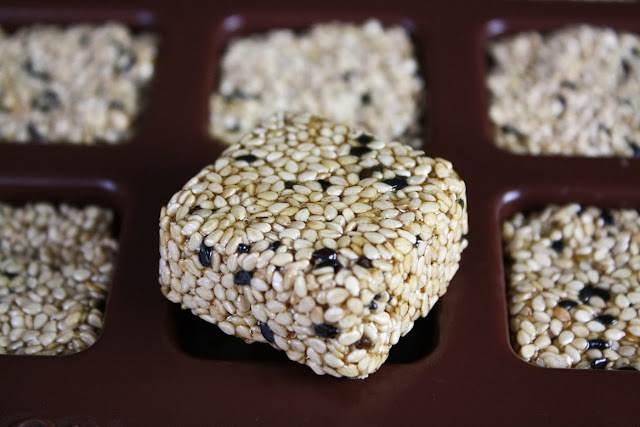 I have made the Sesame Candy about 4 times now, so obviously I like it! Two notes: brown sugar-did you intend packed? And this time I cooked the syrup a little less to see if the candy would be a little softer and it seems to have worked. 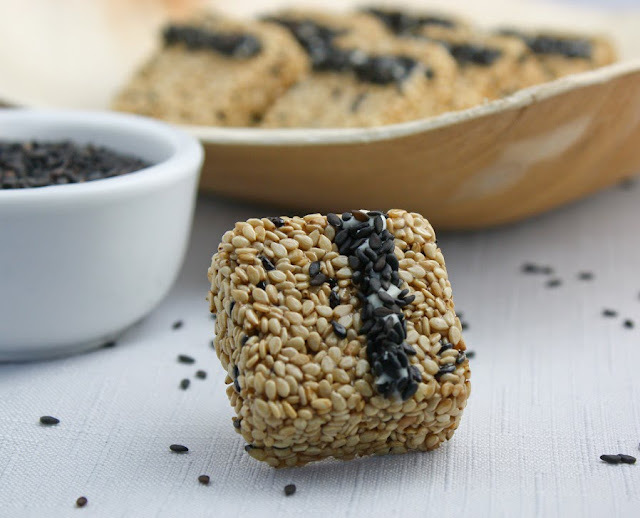 I grew up with an Asian background, and these sesame candies are a staple at Chinese New Year festivities. I thought I'd make some myself this year as a gift and found this recipe on your site, so thank you! Is it me? I can't find measurements for the brown sugar and honey. :( I'm excited to try these out!!! :) Just found your blog and I'm hooked! Hi there! 1/2 cup brown sugar and 1/2 cup honey. I can view it, but some people can't. I think I'll replace that recipe card with text. Your sesame candy recipe has impressed a variety of people. Often times, because they are scored before cooling and then are broken apart in straight lines, people ask if I bought them from a store. Adults and children both enjoy them. Thanks, Heather!